SAN FRANCISCO--(BUSINESS WIRE)--THE MELT, a growing chain of 100% all-natural, fast casual eateries serving fresh, wholesome and made-to-order ‘happy food’ favorites such as: burgers, grilled cheese, fries, mac ‘n’ cheese, homemade soups and salads, today announced Whole Kids Foundation as their new ‘Round-Up’ partner. When guests at The Melt ‘Round-Up’ their orders to the nearest dollar, 100% of each donation goes toward funding grants for edible school gardens and fun food education for kids. 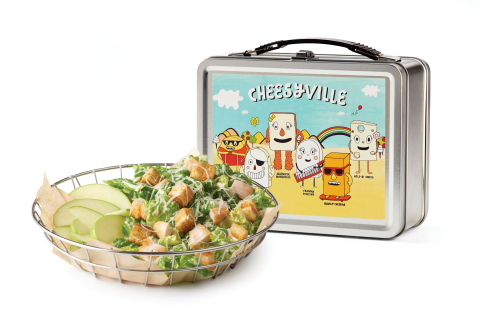 To encourage healthier choices for parents and kids, The Melt has also added a kid’s salad to its special kid menu. Whole Kids Foundation – a Whole Foods Market® foundation – operates as an independent, non-profit organization, with the mission to improve children’s nutrition by supporting schools, inspiring families and empowering kids to make better food choices. Four out of six studies indicate that children are more curious about and willing to try new varieties of fruits and vegetables when they’ve had the chance to experience firsthand how food is grown. “When kids grow food they develop a connection to where it comes from, making them more curious and willing to try new vegetables! Together with The Melt and our other partners, we’re transforming the way kids eat and inspiring future generations to make healthy choices,” said Nona Evans, Executive Director, Whole Kids Foundation. The Melt is proud to provide a platform for guests to help support kids in their communities. ‘Round-Up’ will be available at every The Melt location and via online ordering. Headquartered in San Francisco, THE MELT is a fast casual eatery that combines chef-inspired, all-natural, wholesome food with innovative online ordering technology in an eco-friendly environment. THE MELT’s founding mission is rooted in two key principles; better food for our kids and jobs creation. Today THE MELT employs hundreds of happy crew members and serves real happy foods made from real, wholesome, 100% natural ingredients with names you can pronounce before you eat them. Using only the highest caliber ingredients, THE MELT serves guests burgers crafted with a custom blend of Angus and Wagyu beef, specialty grilled cheese melts that are melted-to-order with real aged cheeses, crispy fries, homemade mac ‘n’ cheese, artisanal soups and fresh salads. In July 2014, the company developed and launched its patented catering ‘Smart Box.’ The ‘Smart Box’ ensures that catered meals provide guests with the same hot-n-fresh high quality standards, as they would enjoy via the dine-in experience. The growth of The Melt is fueled by a solid management team led by Flip Video founder Jonathan Kaplan and a top-tier board of directors including Ron Johnson, former head of retail operations at Apple; Mike Moritz, Bruce Dunlevie and Michael Marks, three prominent silicon valley venture capitalists; and Michael Mina, a James Beard award winning chef and restaurateur. Whole Kids Foundation - a Whole Foods Market foundation - is based in Austin, Texas, and operates as an independent, nonprofit organization. By empowering schools and inspiring families, the Foundation aims to help children reach optimal health through the strength of a healthy body fueled by nutritious food choices. To learn more about Whole Kids Foundation and its salad bar, school garden and healthy teacher programs, visit wholekidsfoundation.org. THE MELT, a growing chain of 100% all-natural, fast casual eateries serving fresh, wholesome and made-to-order ‘happy food’ announces Whole Kids Foundation as their new ‘Round-Up’ charity partner.